The restroom is the most frequently visited place in any type of building. No other area experiences such a high amount of daily traffic and activity. In addition to that, no other place is such a hot spot for transmitting diseases or threatening to destroy your facility’s reputation if it is found in a state of filth and disarray. For these reasons and more, it's important to work with the best restroom cleaning service. Other times you may find yourself in a restroom that, while smelling strongly of a flowery scent and appearing as if they have a restroom cleaning service, is secretly a breeding ground for dangerous bacteria and disease. When you soon find yourself sick and trace it back to that flowery scented bathroom, you again may wonder what that facility was neglecting to do in regards to their restroom cleanliness. The answer to both scenarios is that they are not giving the job to a responsible restroom cleaning service. That is, one that understands the basics of the dirty job and one that possesses the proper knowledge of chemicals and cleaners to do the job right. Good Training is a must for proper restroom cleaning. Clean surfaces first, then sanitize for effective restroom hygiene. Kills odors where they start. Never cut corners by using air fresheners to simply cover up foul odors. Focus on touch points (such as toilet handles and doorknobs), the notoriously germy areas that double as breeding ground for disease causing bacteria. 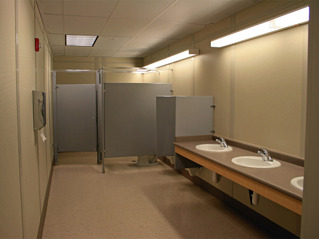 Good restroom cleaning isn’t just about maintaining a “fresh” scent. It’s about taking the time to thoroughly clean and sanitize. In doing so, the need for scented air fresheners is made virtually moot, and the risk of disease drops significantly. Your employees and guests take spotless restroom cleanliness as a sign of respect to them, and they will appreciate it. Outsourcing to a restroom cleaning service that understands the basics will keep customers coming back and employees happy and healthy.